It’s National Ice Cream Month, but since there’s no Frozen Yogurt Month, Gelato Month or Sorbet Month, use it as an excuse to branch out. If you’ve never had authentic gelato, track down a gelateria and dig in. Have a slice of hokey pokey, also known as Neapolitan ice cream. Go global with frozen kefir, from the Middle East, or Indian kulfi. Make a Baked Alaska, bombe, a frozen soufflé or profiteroles. Sorbet lovers should make a granita or Italian ice. See all the frozen dessert in our Frozen Desserts Glossary. 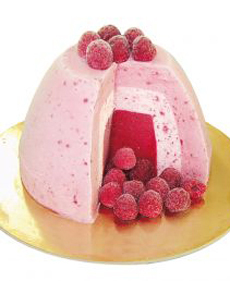 A bombe combines different flavors of ice cream, or ice cream plus sorbet. Photo by Richard Dudley | SXC.